So for years, I have engraved spirit bottles next to the Johnnie Walker laser etching machine during the holidays. I am a little competitive, so I will just put that out there :). At the same time, I understand where other options outside of hand engraving calligraphy make sense for a business. I live it everyday. Laser etching machines are great for some businesses in that if you have 1 standard shaped bottle, the machine can do that and most of the time perform well with what it is programmed to do. It is what it is. However, there are drawbacks to etching machines. If they encounter a bottle that has curves, the glass is a little different (thicker/thinner), if a client wants ornate lettering, limited to a particular character amount, the glass has a coating, the machine breaks or has complications...there goes your Houston engraving event. Also, most of those machines (the good ones) are very expensive. There is a machine that one spirit company in Houston uses that costs...wait for it...north of $25,000. Just a little side note, my rate is not that high. No, no, no. On the contrary, the benefits to having a human hand engrave calligraphy on site for a liquor, wine or fragrance company are: 1) the shape of the bottle doesn't matter 2) the thickness is virtually a non-issue 3) I can work with the curves in the bottle 4) coatings are less of an issue 5) if my handpiece/compressor/regulator breaks, I ALWAYS have 1, if not 2 backup systems with me 6) you want ornate calligraphy...that's what I do :) 7) I have been told that I am as fast if not faster than many of the etching machines. I think that the biggest thing is that a human can adjust where machines can only perform the action that they are programmed for. The human element in hand lettering and calligraphy is so important. It just is. The whisky bottle above is a perfect example. This European client wanted to have this coated, curved bottle engraved in a calligraphic, ornate script, which of course the machine that they typically use is not designed for. So they contacted me. As always, I was delighted to provide engraving for this corporate client and they were pleased with the result. Cheers! Engraving calligraphy in fragrance bottles is definitely a highlight to my work. Seven years ago, I recall thinking "yes, I like to write, but who is going to pay me to do that?" And here we are! AND I love providing calligraphy & hand lettering in fragrance bottles via engraving because the entire time that I am there, the scents are DIVINE. It really is hard to ask for more. Engraving in fragrance bottles provides an easy gift regardless of the occasion as the gift is automatically personalized and is a simple purchase for the "gift giver". I'm certain that there is a more elegant word for that, but I digress. What I love about Jo Malone in particular is that their fragrances are unisex and can be mixed and layered. Cheers! I write. And quite often, I engrave glass such as wine bottles. It's what I do. This is a wine bottle that I engraved last week for Kenwood Vineyards. I have had the privilege of engraving for Kenwood Vineyards for the last 2 years or so. Each event is great as it gives clients the opportunity to try out new wines that they may have been unaware of or possibly don't remember nuances of a particular wine and would appreciate a little reminder. I love being able to personalize each wine bottle by engraving them. Some clients will have wine bottles engraved with calligraphy as gifts for specific occasions or some will have multiple bottles engraved with a simple "Thank you" or "Congratulations" such that when events or situations present themselves they always have an easy gift on hand. And guess what...that engraving was complimentary with the purchase of the wine. Love it! Cheers and hope to see you at the next engraving event! Escribo. Y con frecuencia, grabo vidrio como botellas de vino. Eso es lo que hago. Esta es una botella que grabé semana pasada. He trabajado con Kenwood Vineyard Wines por alrededor 2 años. Cada evento es gran porque el cliente tiene la oportunidad intentar vinos nuevos o vinos que no recuerda. Me encanta escribir o grabar las botellas con mensajes personales como un regalo o para eventos en el futuro. A veces gente comprará botellas para decir "Gracias" o "Felicidades" para eventos en el futuro (en general). Y el servicio para grabar a esos eventos es gratis cuando comprar la botella. Me encanta! Nos vemos al próximo evento. Favor de aceptar mis sinceras disculpas para errores porque estoy aún aprendiendo español. Qué tenga buen día! Over the last few years the bulk of my work has shifted to calligraphy glass & metal engraving for retailers who are looking for a personalization option for their clientele. Due to the versatility of hand engraving, I am able to provide personal messages to a wide variety of items that many laser engravers cannot. Fragrance bottles, wine & liquor bottles, glass chalices, champagne buckets, metal pens, wine & beer bottle openers, knives & golf clubs are all just some of the surfaces that I have engraved. Here I was engraving this past weekend for Stella Artois and Anheuser Busch. Every event with this group has been a success. So far this year, they estimate that I have engraved about 2,500 chalices. AND I LOVE IT! Cheers! It has been my immense pleasure to engrave and work with Anheuser-Busch & Stella Artois over the last few months. As we still have roughly every weekend on the calendar booked through September, I expect that the good times at these engraving events here in Houston will continue to roll. Engraving glass is one of my favorite things to do and I just love providing clients with their own personalized chalices. I hope to see you at an event in the future. Cheers! I have found that every teacher that I have learned from has exhibited these 3 qualities. I have also seen people begin to teach much earlier than they should. I think with the advent of social media, many people have received the "your work is great" along with a "like" and then believed that they should impart their wisdom on the world whether that is based in reality or just their (and their friends') minds. I never wanted to be that person that stepped out there as an "expert" unjustifiably so. I feel that I am still learning and therefore am constantly taking classes from leading penman around the world. In truth, I don't believe that my calligraphy work is there yet. Still needs fine-tuning. Also, the desire is not there for me as I absolutely enjoy "creating" work for my clients...not so much teaching. At the same time, beginners will ask questions that I do feel qualified to clarify. Not necessarily answer, but clarify. One recent question was how to calligraph or engrave an ornamental, majuscule C. That, I can do. The video above is from a project of wine glasses. Even here, this C is not perfect. But it isn't too bad. Check it out! 1. Engraving of calligraphy in metal.....I do that...CHECK! 2. To use their logo.....I can do that...CHECK! 3. The champagne bucket has a few different metals...however, Janet realized that under there is STAINLESS STEEL....CHECK! It would be hard for this to become easier. OK, so it is true that if I engrave a logo vs my script that it does take an additional step or two and therefore additional time. However, it's no problem. Mission Accomplished! Cheers! Tada! Engraved metal champagne bucket with a logo...DONE! Fast-forward to 2018. I have moved full-steam ahead with commercial calligraphy work in Houston and I have hit my sweet spot. I have expanded my portfolio with corporate events, logo design work (such as the above), content/lifestyle shoots with calligraphy, wine and spirit engraving and even my own passion projects such as mirror work and calligraphy art on canvas. The logo design above was a total right place/right time/knew the right person type of thing. Natalie Vaclavik was getting started with CultivateCurio while we were working together on a few projects. Natalie is that person that met the person at the place for the thing and she totally remembers everything about them and what they are doing etc etc. Natalie knew some groovy ladies that were also working on a restaurant/wine bar project called Oui Oui. AND Tada! Another calligraphy job for the penman! This calligraphy project was SO great in that I provided a number of ideas (while working a few other calligraphy jobs at the same time.... SSSSHHHH!!!! Gotta make a living :)) and they liked a few of them on the first shot and they also knew EXACTLY what tweaks they wanted. A penman's dream client. DONE! This was a groovy brush letter calligraphy job that I would do again and again. I LOVE MY JOB! Cheers! Oscar Wilde is one of my favorite writers... I adore his wit. 2018 has been a year of transition so far. Dear god, it feels like the last few years have been transitional...such is life.... hahaha! As you know, I decided to turn full tilt into commercial calligraphy and artwork here in Houston that interests me this year. It has been AMAZING and I couldn't be happier! One thing that I wanted to do was smaller mirrors for home decor as well as the large fine art mirrors. for the Confidently Lost collection. One of the smaller mirrors that I placed calligraphy on is above. I am an avid reader & a huge fan of Oscar Wilde. His wit is unparalleled and was considered daring in his time. I love this quote as it reminds us that moderation is important, but at the same time sometimes you just need to let loose. Relax and have a little fun. This mirror is for sale on Etsy. Another quote of his that I love but have yet to place on a mirror: "I don't want to go to heaven. None of my friends are there." Adore that! Cheers! 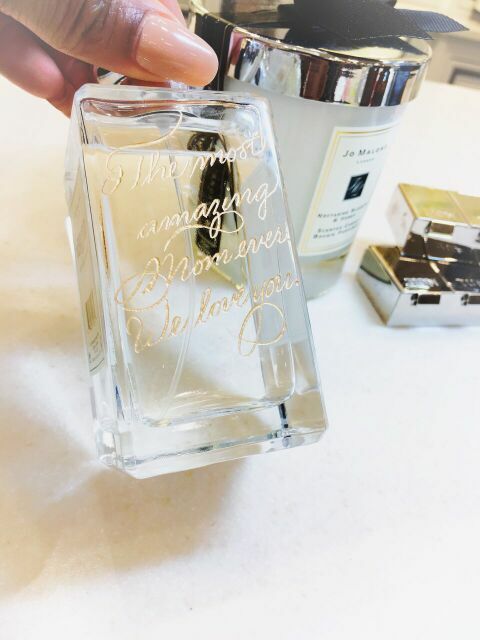 It was such a pleasure engraving calligraphy here in Houston for Jo Malone Fragrances last week leading up to Mother's Day. It's so amazing how much you can learn about other disciplines from engraving calligraphy for them. For instance, did you know that you can "layer" fragrances meaning that you may wear various fragrances at the same time to create a customized fragrance just for you? Ok, so maybe I was the only person that didn't know that likely because I don't shop. Jo Malone's fragrances are on the minimalist side in that they use far less ingredients than other brands making them perfect for layering. 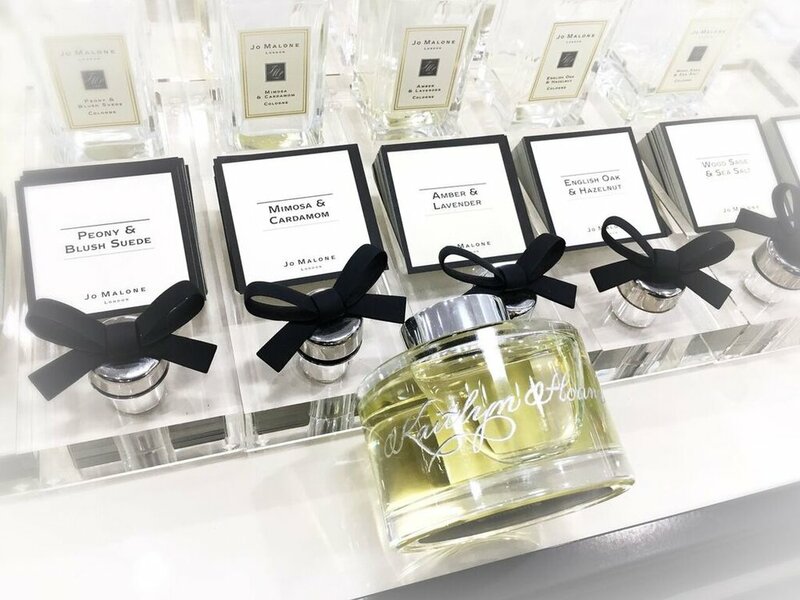 Did you know that many of the Jo Malone fragrances are unisex? I didn't know that. Between engraving, the amazing ladies, Marjory & Nadia, helped me find my perfect scents at the Macy's at Memorial City Mall. I love floral and sweet scents with a little flirty feel. Sure enough, they created fragrances that were perfect for me. Love it! I was extremely pleased to be asked to engrave calligraphy for Anheuser-Busch and Stella Artois in Houston for roughly every weekend between April and September 2018. Engraving for wine and spirit events has become a comfort zone for me, but beer is a first. Why is that? Typically, beer engraving events would be off limits for me as beer and champagne are bottled under pressure and have a possibility of exploding during or after the engraving process. Yep...engraving=good; explosion=bad. I love that Stella Artois has these beautiful chalices that completely circumvent that concern. SCORE!!! Check out this video of me engraving this chalice for a gentleman named Daniel. Cheers! SSSOOOO... As I have started down the rabbit hole of engraving with Anheuser-Busch and Stella Artois, I have been intoxicated (love the play on words) with the commemorative chalices. This one was released 18 April 2018 and it is the wedding chalice. Isn't it gorgeous? AND it has a cocktail recipe that goes with it (below). If you happen to obtain one, bring it to one of the events this spring/summer as I would LOVE to engrave it. Just gorgeous! Cheers! NEW YORK – April 18, 2018 – Today, the storied House of Stella Artois debuted its Limited-Edition Stella Artois Regal Chalice in celebration of the world’s most anticipated nuptials. The Stella Artois Regal Chalice’s gilded design celebrates the transatlantic love story of an iconic pairing of European and American heritage – just like the brand itself – in anticipation of a wedding day that will long be remembered. Crafted with an elegant gold design, the Limited-Edition Stella Artois Regal Chalice brings the fairytale story of the betrothed to life through nineteen gilded icons that hold special meaning to the happy couple. Put your knowledge to the test and see if you can find them all! From the social media post that sparked relationship rumors, to favorite pastimes of the couple and the storied engagement ring that made it official, the nineteen illustrations bring the epic journey of the couple to life, with the number representing their wedding date: May 19, 2018. In an ode to this momentous date, the Stella Artois Regal Chalice is available for $5.19 atwww.stellaartois.com/regalchalice, until royal fans claim them all. Introducing Le Cidre Royale – a cocktail fit for even the grandest of wedding receptions, inspired by the cake to be enjoyed by all guests. Comprised of Stella Artois Cidre, Rosé Champagne, Gin and Elderflower Liqueur, it is a cocktail worthy of a regal toast as loyal fans everywhere cheers to the happy couple on May 19. A few weeks ago, I was contacted by PÜR Cosmetics to engrave initials in calligraphy on cosmetic foundation sticks during the Ulta National Meeting. If you have ever worked with a makeup or beauty company, you are very familiar with how much fun these calligraphy engraving events can be as the music is turned up along with the energy level. They informed me at the end that I engraved somewhere between 400-500 foundation sticks with calligraphy. That's crazy, but so groovy! From an engraving perspective, working in plastic has not previously been my forte. Plastics are "hit or miss". All plastics are not created equal ESPECIALLY when you are talking about engraving them. However, as with anything the more you do it...and figure out the right equipment to use...it becomes easy. I did learn awhile back that engraving in certain hard plastics is much smoother if I use engraving burs that are NOT fresh. To me this seems counterintuitive especially in contrast to glass, but that has been my experience. It was so nice to not only work with the PUR Cosmetics team but to also meet store managers with Ulta from all over the country. And of course the makeup around the convention center was impeccably flawless. Cheers! As you know, engraving events are one of my favorite outlets for calligraphy. I am pleased to say that I will be engraving calligraphy on chalices for Stella Artois and Anheuser-Busch roughly every weekend between now and September. To say the least, this is going to be SO MUCH FUN! Let's do this! Engraving calligraphy in a glass canvas is truly my jam. Over the last few months, I have developed a preference for #8 carbide burs for engraving wine & spirit bottles. Years ago, I wouldn't touch a size 8 bur with a 10 foot pole. It takes much more control than the smaller burs. But oddly enough, the more you engrave, the simpler some things feel. Who'd've thought?! I can now take 1 #8 bur and engrave for an entire event (and sometimes another event) for wine & spirit bottles. I have found it to be more cost effective and I prefer the look of the lettering as it yields a deeper, smoother cut. I will admit that the glass in the picture was engraved with an 8 that i keep around the studio, so it's not fresh, but still did a great job. OK, enough geeking out on engraving calligraphy. I hope to see you at one of the Stella Artois Chalice Engraving events this spring/summer. Check out the "where & when" here on the events page. Handwriting fills a human need. “It involves us in a relationship with the written word which is sensuous, immediate and individual. It opens our personality out to the world, and gives us a means of reading other people.” ~ Philip Hensher in "The Missing Ink"
So my last wedding hand lettering project has just been completed. It was a calligraphy welcome mirror for a wedding later this month. A little bittersweet, but excited about the future. Cheers! I have FINALLY completed the hand lettering for the Lord Byron love letter calligraphy mirror. Other projects pushed it back longer than I desired, but here we are. Love is such a thing to be treasured that when I found this letter to his "Dearest Teresa", I had to ink it on a mirror. I have become extremely passionate about calligraphy over the years and even more passionate about expressing oneself in the manner that is most genuine. This collection is extremely personal to me for a number of reasons. One prominent reason is that it is the first time that I have pursued a calligraphy project purely for my own interest. Isn't that an amazing feeling? This is now available for sale in the shop. Cheers! While working on the Confidently Lost calligraphy love letter collection, I had a wonderful time collaborating with Three Smudges Photography for the photo shoot. Here, we had "adventures in not catching my hat on fire". GROOVY TIMES with calligraphy in my sweet home known as Houston!!! As you know, I enjoy working with businesses for commercial calligraphy work. I have found that it is the best fit for me and have (FINALLY :) shifted my business completely to that realm. This project was for a jeweler in the Atlanta area that desired hand lettering / calligraphy for the company logo. This amazing force behind Strands of Grace jewelry, Lisa Brunson, creates beautiful pieces using various precious stones and an array of materials. 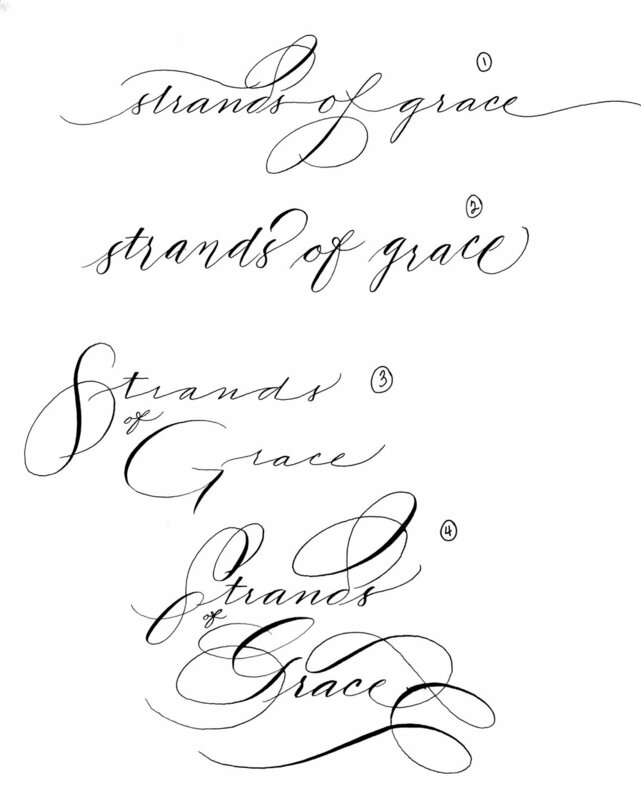 We went through a few options for calligraphy / lettering, but ultimately went with the above version. Como tú sabes, me encanta trabajando con negocios para calígrafa comercial. Este trabaja para mi. Ahora, mi empresa es totalmente comercial. Lo tomó tiempo, pero estoy aquí...por fin!! Este proyecto era para una joyería cerca de Atlanta. La Fuerza detrás Strands of Grace, Lisa Brunson, crea piezas de piedras preciosas y varias materiales. Fuimos por varias opciónes y la opción arriba era el final. Favor de aceptar mis sinceras disculpas para errores en español porque estoy aún aprendiendo. Gracias! It was such a pleasure engraving wine bottles for the Z. Alexander Brown winery! This client requested bottles with a simple "Thank You" engraved for all of the people that he wanted to thank for assisting him during the Hurricane Harvey disaster. I love that calligraphy & engraving can play a part in this thoughtful gesture.